"Friendly check-in, decent sized room." 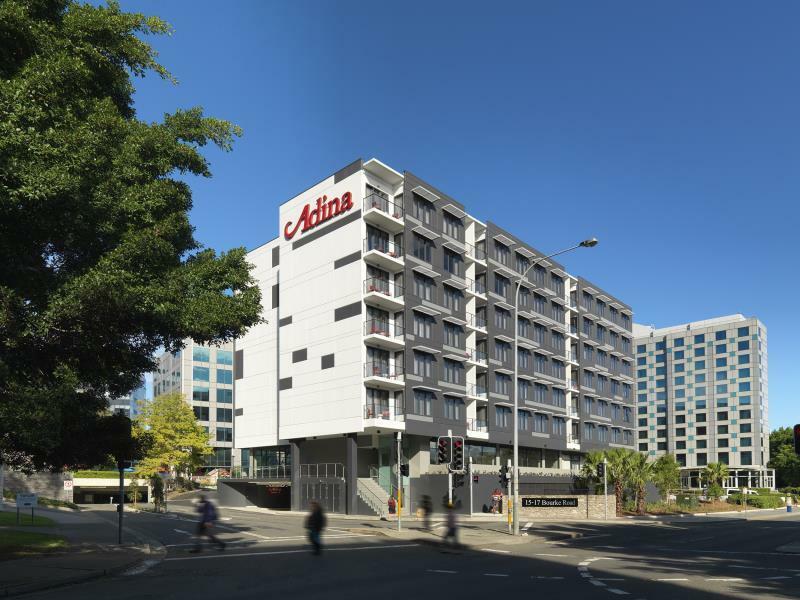 Have a question for Adina Apartment Hotel Sydney Airport? "Great facilities in our apartment." "I think that It was the best hotel of Sydney, Melbourne hotels." 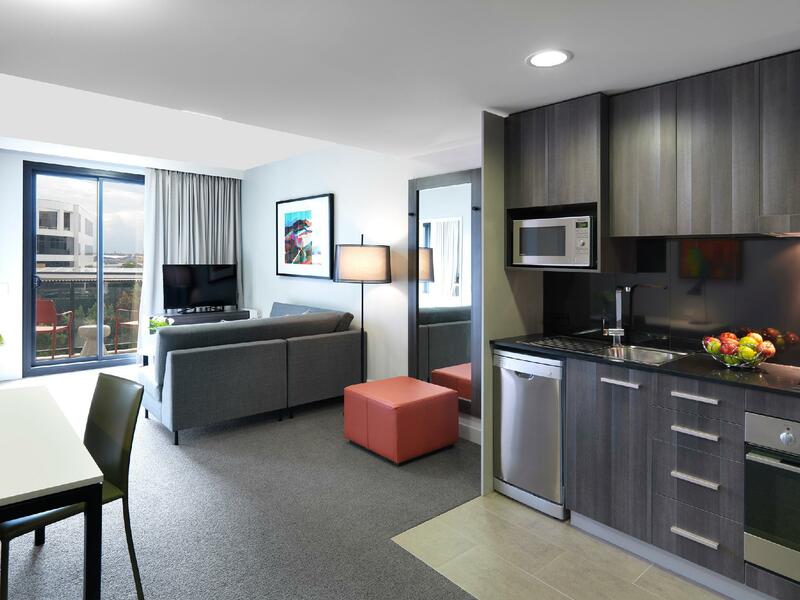 "Location is within walking distance to Mascot Station and close to the Airport by shuttle bus for booking can be made directly at the hotel counter." 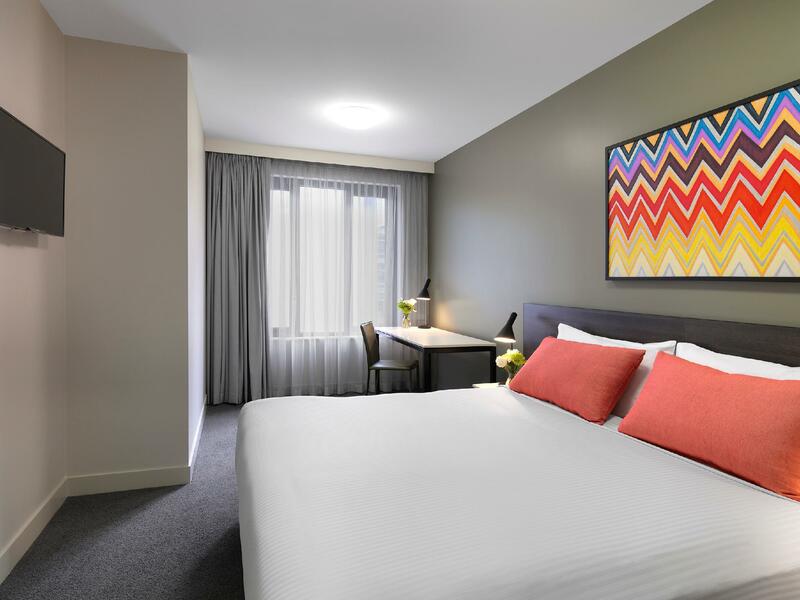 Adina Apartment Hotel Sydney Airport offers a stylish, spacious, and convenient place to stay, less than one kilometer from the Sydney Airport. 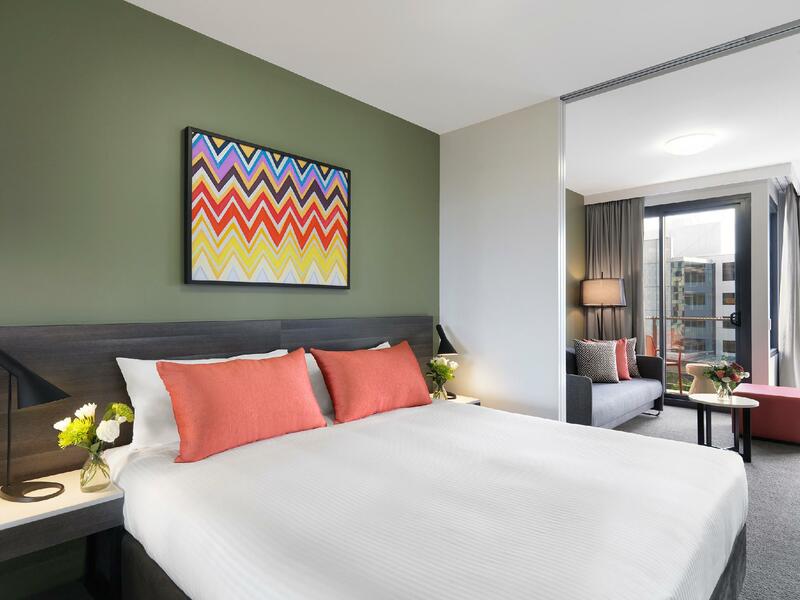 The hotel is home to 123 serviced apartments across seven levels, accommodating for the business or leisure traveler and families alike with studio rooms and apartments. This fully serviced apartment hotel brings apartment-styled accommodation to the thriving Mascot business hub, making time in transit more comfortable. Fully equipped kitchens will allow guests to enjoy a home cooked meal, or guests can relax in the on-site restaurant and bar. 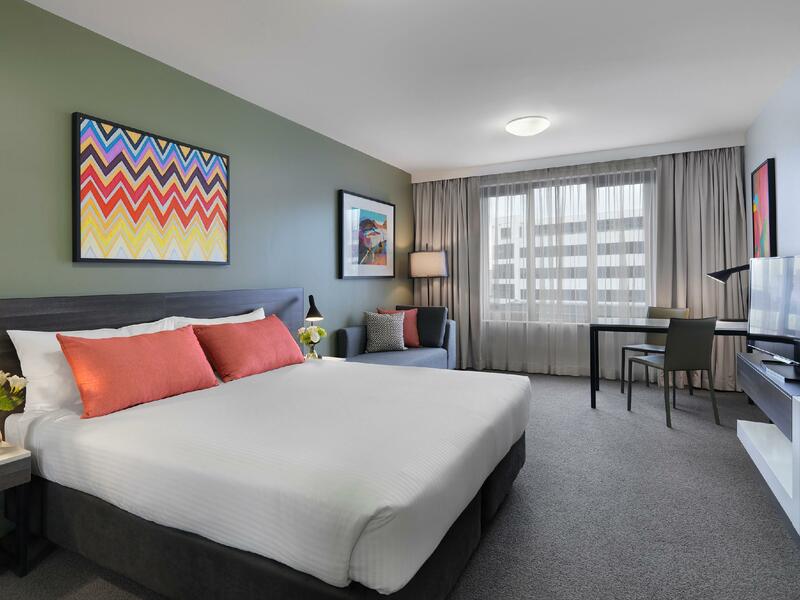 Adina Apartment Hotel Sydney Airport is well positioned just 250 meters from the Mascot train station and a short 15-minute drive to Sydney’s central business district and key tourist attractions. "Hotel offers affordable Airport Shuttle which is great :)"
Wi-Fi/Internet access is available at the property at no additional charge for a limited time or amount. Charges apply thereafter. Our room was comfortable and well appointed. Check in was easy, the price of parking is absurd but I think it is standard for Sydney hotels. Found a nice place for dinner a short walk towards the nearby train station. Overall happy with our one night stay. Got one bedroom apartment. Large room setup. Recommend to friends and will stay again. Need to get transport to everywhere and to get to CBD. But close to train station and bus stops. Very happy with hotel/room. 마지막날 공항으로 가야되서 동생과 1박 묵었습니다. 시드니, 멜버른 10박 여행 중 가장 가격대비 뛰어나고 제일 좋았던 룸이었습니다. 다음에 시드니를 간다면 번화가와 조금 거리가 있더라도 묵을 것 같습니다! I had to go airport tomorrow so, I stayed at this hotel with my sister. I think that It was the best hotel of Sydney, Melbourne hotels. if I go Sydney, I will stay at this hotel again. Hotel hard to find at night if you are coming from Mascot train station , signage not visible. Nonchalant staff the night we arrived, no help with luggage or even open door. Shower head needed to be held steady in one hand while showering. Very cozy and convenient location. The hotel is only a few min walk from nearby station! Good place to stay!! Very centrally located close to the domestic and international airports. Walking distance to some great restaurants and Woolworths. Also within walking distance to train station. So it was easy to go into the city and back as well as to the airports. The coffee shop on the premises serve good food and drinks at reasonable prices. Really nice place. Comfortable king size bed, very clean, tidy and modern. Kitchenette has all one could need. Location 10 minutes walk from Domestic Terminal. 5 minute walk to Mascot train station and Woolworths accross the road from the station. Will come back for sure. 2 ladies at the reception are really accomodating , but at around 11pm reception is different, they look unhappy , tired and grumpy. They are working in the hospitality industry, they need to smile. Microwave was not working, kettle was dirty. Location is within walking distance to Mascot Station and close to the Airport by shuttle bus for booking can be made directly at the hotel counter. Room is spacious, clean, tidy, comfortable and quiet. Parking is a little expensive at 30 per night but convenience of direct lift assessibility to the secured basement parking is worth it. Though it was just an over-night stay, I was really impressed by the size of the rooms. Its one of the best at this price point. It has all facilities for a long stay which includes a washing machine and dryer in additional to all the normal amenities. The Hotel is just a 10 minute drive from the Airport and they even provide shuttle to both Domestic & International terminals at a nominal cost. The staff were very helpful in the short time I stayed. Would definitely stay again. Great location, close to public transport, airport and city. Large room with modern facilities. Good choice for stopover one night before or after flights. Booking early with Agoda discount is not expensive. The check-in was OK. But what was disappointing was that upon our arrival at this hotel, there was no assistance to help carry our luggage despite the fact that I was with my aged mother. We had to carry our luggage all the way to our room...this is considered very bad for a 4 -star hotel..... And being a 4 star hotel slippers should be provided. Cafe/Restaurant was lovely but did serve my Coffee in a chipped cup!?!? Front Desk staff were exceptionally helpful on our check in. I will definitely be recommending this place to others and coming back. Close proximity to Airport & Trains easy to get to city central for show’s, shopping, meetings, or restaurants. Spacious apartments. Clean & modern. Staff were efficient & helpful. Great location, near mascot station (within 5min walk) just abit dark when you walk back. Lack of front desk staff, normally only see 1 staff, so you have to wait for check in and out. Near supermarkets (Woolworth and Asian), eateries and restaurant. 1 or 2 stops away from airport. There are 3 of us, but they always forgot to give us 3 towels, we had to call and ask for it. I was not aware that heater was on timer and took me awhile to figure out, so please remember to check.